There are times when coming up with New blog topic seem so difficult. In times like this, it wouldn’t matter if you have to go scouting here and there for blog topic ideas; so long the result is a smooth blogging journey for you. It’s okay to be tired of scouting the web and looking for blog post ideas or topic ideas every time you are ready to publish a new post, but you can save yourself a lot of stress by doing any of the exercises below. Most are just perfect for lifestyle and personal bloggers while others are great for any blogger so long you don’t get tired of getting lots of new topic ideas without sweating too hard. Though this might sound dumb to you in the first instance in your search for blog topic ideas, I bet it wouldn’t seem so foolish when you give it a trial. You’d love this strategy if you are a personal, lifestyle, fashion or even a travel blogger. If you’ve got time to spare while doing what you enjoy or hate doing, chances are, there is something unusual and intriguing to experience or actualize. There is always something different about each day and every day holds a different surprise for everyone. There are various questions and answer sites, of which Quora and ask are great places to start with. Required answers to multiple questions cut across different blogging topics and niches. There’s every possibility that you will get a new blog topic with every moment you spend on such a website. Quora is probably the best place to join because of its simplicity and ease of use. You can choose categories you are interested in and leave out those you have no business with. Every blogger who enjoys writing their blog posts from imaginations having traces of verisimilitude will often get flashes of blog ideas even in the most precise moment. It’s normal to think about new blog topics even when you aren’t ready for an original blog post, but it would be great if such thought/idea is jotted down for the perfect time. There are various note-taking applications online for smartphones which could help save the blog ideas because most times, these topic ideas run off as quick as they come in. 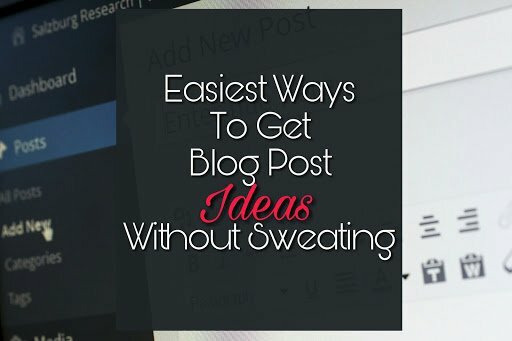 Though this might not be one of the brightest ideas you’d expect, it sure is one of the best ways to come up with blog post ideas. You can see search traffic from your Google search console dashboard and keywords that trigger your blog in the search engine. These keywords are often questions and request that are related mainly to what you blog about. You can always get new topic ideas from these search keywords. This practice will not only increase your blog post ideas but also your chances of boosting your blog to a better page in search results. Although old posts are as good as great, reading your previous blog posts is sure to trigger an empty space that you feel has to be touched or retouched… You can always improve on blog posts by creating newer versions. A hack that worked a few years ago might not be so reliant presently, thus there is room for renovation and update! Change is always constant. So, what do you think? If you’ve got any idea to share, drop something down below. Hopefully, the above five straightforward ways of coming up with new blog post ideas help someone blog better. Using Quora to generate blog post ideas is a great tip! Love that you can see how many views each answer has to gauge demand on specific topics. Thanks Joseph! So many ideas slipped away when I was not able to write them down. After some time I learned to write down all the flashes of ideas as you said. Some of them were realized, some not, but at least I didn’t have to re-think what I had in mind before. That Number 3 saves me many times. Thanks for this!